I was looking for a business account that I could manage online, be free of fees etc., and one that I could trust. I have found that in DCU. 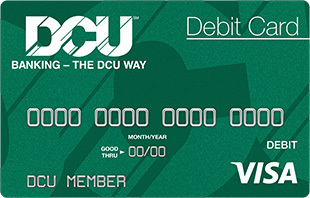 The DCU Visa Debit Card is your debit card for shopping and your ATM card for cash. Available with your DCU Business Checking Account  You must have a DCU Business Checking Account to have a DCU Business Debit Card. Use it to shop at millions of retailers  Use it at most locations that accept Visa Credit Cards world wide. You can also shop at Point-of-Sale (POS) locations that accept ATM cards with your DCU Debit Card and PIN. It's faster than checks and sometimes faster than cash. Purchase amounts are deducted from your checking account. Use to pay bills where Visa® is accepted  Billers that accept credit cards for payment will also accept your DCU Debit Card. Purchase information shows on your statement and Online Banking  The name of the vendor you paid with your DCU Debit Card shows with each transaction while only the check number shows beside checks. If you use Quicken or QuickBooks, that information is included when you export transaction information from Online Banking. Use it at the ATM for cash, deposits, or transfers  At non-DCU ATMs, use it to make withdrawals, deposits, transfers, and inquiries on your DCU Business Checking Account and Business Savings Account. * At DCU ATM locations, you can access virtually all your DCU business deposit accounts. The sole proprietor and authorized signers may have their own cards  Up to 4 cards total. Use your DCU Debit Card to buy anything at millions of locations worldwide where Visa Cards are accepted. Just give them the card and sign the receipt. At automatic gas pumps, there's nothing to sign. Just insert your card, press "credit," and start pumping. Transactions clear your DCU Business Checking Account in one or two days. You can also use it for purchases by electronic Point-of-Sale (POS) wherever you see the ATM network logos listed below. Swipe your card through the reader and input your PIN. The money immediately comes out of your checking account. Many NYCE and CO-OP ATMs accept deposits. See DCU ATM Locations to find the network ATM closest to you. *Balance inquiries and withdrawals are $0.75 each at non-DCU ATMs (where accepted). Deposits are always FREE at qualified Deposit-Taking Network ATMs, check at the DCU ATM Locations link above. Some institutions may surcharge you if you use their ATMs. Avoid these surcharges by not using these machines. ATMs must be identified with signs or screens disclosing surcharges. All SUM ATMs in Massachusetts and most CO-OP ATMs nationwide have no surcharges. Please refer to DCU's Truth-in-Savings Disclosure and Account Agreements, Schedule of Fees and Service Charges and Electronic Services Disclosure and Agreements. "Kept DCU For My Business, Been A Member Over 10 Years!" Can't imagine using another bank, their hours are great for small business owners and the lack of unnecessary fees explain why they are so easy to work with. Never a hassle! I recommend DCU to any friend, family, and even other business owners! ATM Locations  Find all DCU ATMs and get links to network ATMs. Electronic Services Disclosure (.pdf format, 11 pages)  This covers disclosures related to DCU electronic services such as Debit Cards, ATM Cards, Online Banking, and Easy Touch Telephone Teller system. Funds Availability Policy (HTML)  This covers DCU's policies regarding holds on deposits. Truth-in-Savings Disclosure (.pdf format, 36 pages)  Covers disclosures related to all DCU savings and checking accounts. DCU's Funds Availability Policies are covered here.